Yes, I made yet another trip to the Schilling Cider House! Check out my past posts here. This time it was for a Sidra event, but that is one type of cider I’m just not into, so I sampled some non-Sidra selections from of the tap list (and some bottles). The Cider Log crew was there, and brought an awesome spread of Spanish treats–thanks for sharing! I started with a flight of six, as usual. Tieton Cider Works Cranberry, 6.9% ABV: Semi-dry to semi-sweet. Very tart! Lots of cranberry flavor. More tart than the Finnriver cranberry cider I tried at the same time (see below). A bit astringent. I’m a bit over cranberry (I used to like it more), so I prefer most of Tieton’s other ciders to this one. This is a new release for them, and its also available bottled. Doc’s Draft Pumpkin, 5.0% ABV: Sweet. Lots of pumpkin pie spices with a bit of earthiness & pumpkin flavor. Full bodied. Unlike many pumpkin ciders & beers, this one uses actual pumpkin. I’m not a pumpkin or spice fan, so needless to say I didn’t really enjoy this cider (I tried it more out of curiosity). The folks who blind tasted it for this article were much bigger fans though, giving it the highest score of 23 pumpkin ciders & beers! This is a yearly seasonal release for Doc’s, and also available bottled. This was my second time trying Doc’s, but neither were flavors I’m a fan of…hopefully I get a chance to try something I have a better shot of actually enjoying soon (I’ve been eyeing their Sour Cherry, but alas it isn’t sold in the Seattle area, so I may need to make a trip down to Portland OR or order online). Reverend Nat’s (and Cider Riot!) Ciderkin, 3.2% ABV: Dry. Ginger! Moderate tartness, astringency, and acidity. Slightly funky. Ciderkin is a lower alcohol content cider traditionally made from the pommace (apple skin and pulp leftover after pressing apples into juice). This one however is quite different than the version of ciderkin I had awhile back from Argus (tasting notes here). The ginger (although admittedly mild) was overwhelming for my palate as I’m just not a fan of it. My favorite cider from Rev Nat’s so far is their Revival. They’ve released this Ciderkin cider a few times, but it doesn’t appear to be available bottled. Liberty Ciderworks Gravenstein, 8.0% ABV: Dry. Moderate sourness, tartness, astringency, tannins, and acidity. Almost no carbonation. Very mild on the nose. Although this was a Gravenstein single varietal, I picked up a lot of crabapple notes…it reminds me of their Crabenstein, which used Gravenstein and Crabapples, although not quite as harsh. So far I prefer their Manchurian Crabapple, English Style, and Stonewall to this one. This cider is also available bottled. Finnriver Cranberry Rosehip, 6.5% ABV: Semi-sweet. Moderate tartness. Lots of cranberry flavor. I didn’t really pick up any herbal (rosehip) flavor, but I imagine it mellowed the cranberry a bit, especially drinking it side by side to the Tieton variety. I liked this one better than the Tieton Cranberry, probably as it isn’t as tart. However, my favorite “cranberry” cider so far is probably a tie for this and Schilling’s Mischief Maker (cranberry-pomegranate). Cranberry Rosehip is part of Finnriver’s Elijah Swan Seasonal Botanical line, which is also available bottled, and includes some of my favorites such as Honey Meadow and Lavender Black Currant. Apple Outlaw Blackberry Bounty, 5.5% ABV: Semi-dry. Very mild berry flavor. Mild tartness. This seems to be another one of the drier and milder flavored berry ciders coming out. This one was pretty average in my book. It is also available bottled. This was my first time trying their regular line of ciders (although I tried their Oaked Sweet Dark Cherry at Cider Summit Seattle 2015, which appeared to be a special draft release). I also had a sip of Whitewood Red Cap. It was a bit weird…dry and almost Sidra-ish with some sourness and quite mild flavored. They describe it as a Session cider, which usually indicates a low ABV and easy to drink cider, but its 6.2% ABV. Also available bottled. It reminded me some of their Summer Switchel, but without the salty & ginger notes. Both are quite different from their Kingston Black Whiskey Barrel Aged cider, which is amazing! I mostly wanted to sample what Schilling had on tap that I hadn’t tried, despite not being too excited about the varieties. Therefore there were a few I didn’t really enjoy, so I ended up not finishing a lot of the flight. Thankfully that freed up some ability to try more ciders! Next up we sampled a couple bottles (which I don’t believe they sell at the Cider House). Ace Space (blood orange) was another weird one. Odd hazy orange hue. Semi-dry. The nose and some of the flavor was almost medicinal/artificial (like Tang or a Vitamin C supplement), but there is definitely some blood orange flavor too. Mild tartness and sourness. I wasn’t really a fan…not sure what they were thinking with this one? 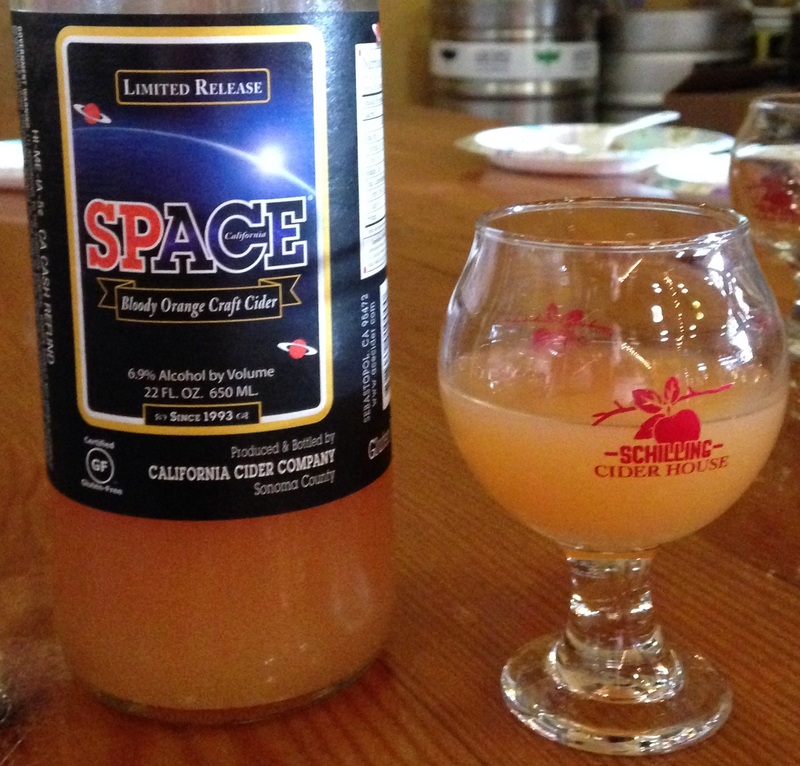 This is Ace’s newest cider, a special release. I kinda had the same opinion on their last special release, Blackjack 21, which tasted like Chardonnay to me (although admittedly it was aged in Chardonnay barrels, so maybe they were going for that). Apparently I’m in the minority though as it sold well so they are releasing it again this year. Carlton Cyderworks Sugar and Spice. Semi-sweet. I was surprised I liked this, as I usually don’t tend towards spiced cider. However, the spice was quite mild and balanced. It also wasn’t overly sweet. This is a seasonal bottled release for them, new for this year. I also had a pint of Snowdrift Red–yum! One of my favorites. However, this batch seemed a bit more tart than previous, and with a bit less fruitiness. There can definitely be variability from batch to batch in a craft product. I like when cideries such as Snowdrift batch label their ciders, so you know whether what you buying may be slightly different. Anthem is another example of a cidery which does this, but they actually go so far as to use different apple varieties in different batches of their flagship cider (and you can look up what was used by the batch number on the bottle). Oddly enough the Carlton Sugar and Spice was the winner of the afternoon as far as a new cider I enjoyed the most! I think it would taste really good warm (which is how I like mead, but I haven’t tried that for cider as I usually avoid spiced cider).